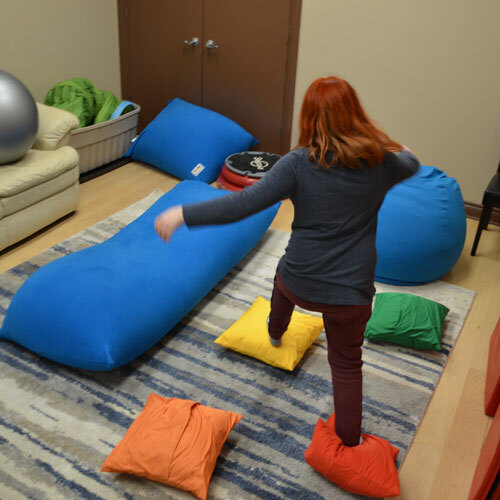 One of the most unique features about the OCATT Clinic is our SMART (Sensory Motor Arousal Regulation Treatment) room. Children, who have experienced trauma live in a state of fight/flight/freeze much of the time – this is the way a trauma affected brain works to find safety. Unfortunately, we do not do our best thinking or processing of new information while we are in this state of trauma. This can make “talk therapy” challenging. Research and practice has shown that beginning therapy with sensory strategies (physical movement, etc) helps the brain “feel safe.” With this sense of safety we are much more likely to be able to relate, listen and process new information in order to understand the meaning of traumatic experiences. With this in mind, OCATT has a specialized SMART room where healthy, purposeful and fun movement is encouraged through a counselling session. We have squishy, oversized bean bag chairs, mats, balancing boards and other equipment that children find fun. These SMART techniques help children feel safe and connected to their therapist more quickly than in a typical therapy room. We are finding that this SMART movement can be particularly helpful when children have verbal processing issues – the movement provides new senses of safety that open up new ways to communicate well. Interested in exploring how sensory strategies may benefit your child?